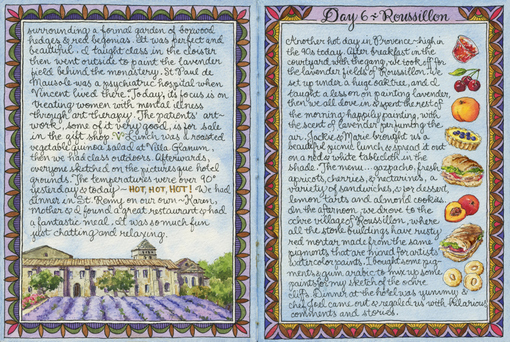 It's been a busy spring here at Summerhill, and I've been doing more planting and mulching than blogging and painting lately, but before I leave for Maine tomorrow, I want to share with you a few of the pages from my Provence sketchbook that I haven't gotten around to posting here yet. 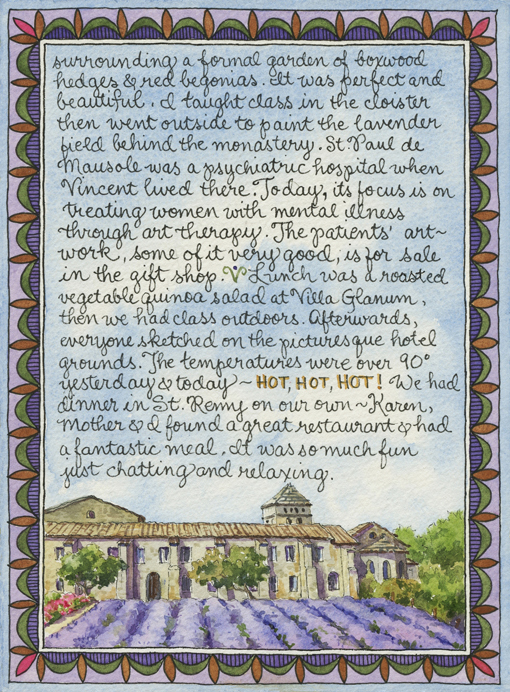 When I last posted about my France travel journal, I wrote about our visit to the monastery at St. Paul-de-Mausole in St. Remy-de-Provence. 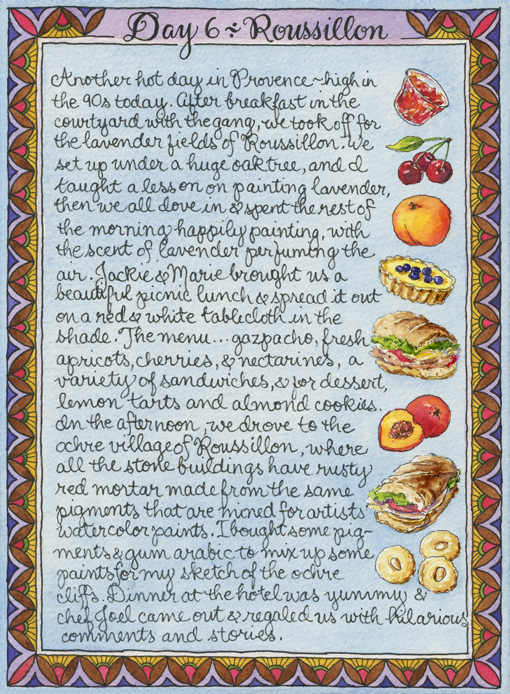 The text on the page below is a continuation of that day, part of a French Escapade painting tour. 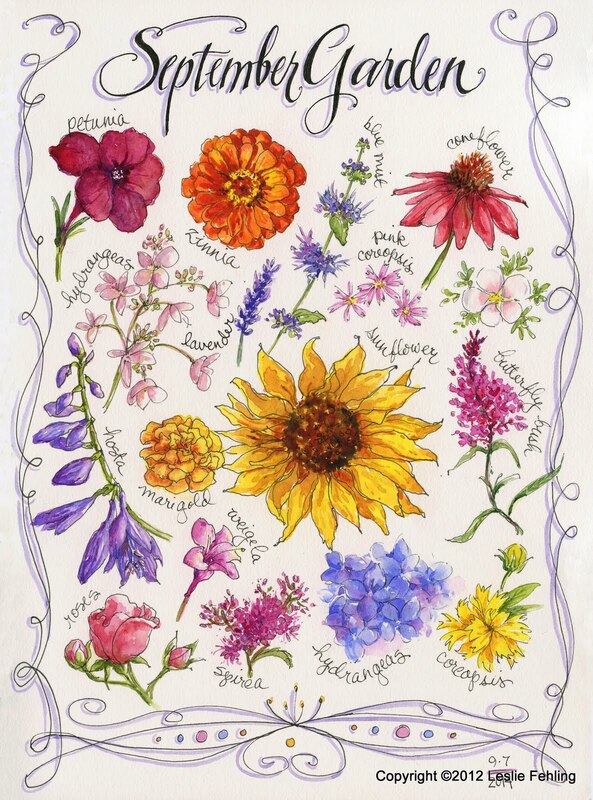 When I have a lot of journaling to do, I don't like to have an entire page in my sketchbook filled with nothing but writing. I try to think of something I can do to make the page more interesting and tie it in with the rest of the travel journal. Since I had quite a bit of writing to catch up on here in this two-page spread, I decided to tie the pages together by painting the backgrounds of both pages cerulean blue. 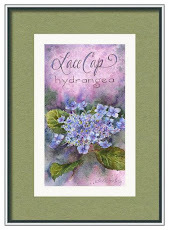 I also designed same-sized borders for the two pages and used an almond-shaped motif in both designs, even though the designs themselves are not identical. The color schemes vary sightly on the two borders, but they repeat many of the same colors. The page on the left has a small landscape of the monastery building, viewed from the end of the garden (the area that I sketched on the previous page in my sketchbook), while the page on the right shows the picnic lunch that we enjoyed the next day. I think adding background washes, small sketches, and interesting borders to text pages makes it more fun to read them! and guess what my lesson was on that day....how to paint lavender! Surprise, surprise! We spent the entire morning on location, settled comfortably in the shade under the spreading branches of an old oak tree. 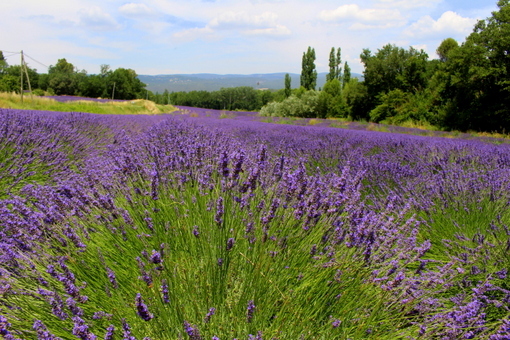 The children of the field's owners had a stand set up right next to us, selling bunches of fresh-cut lavender. It smelled SO GOOD! 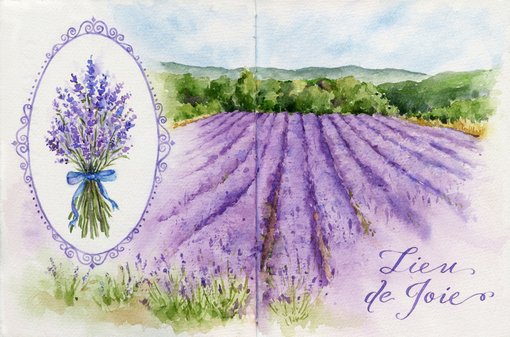 I managed to complete my lavender field vignette sketch that day, in between jumping up and down to check on my students and assist them with their paintings. Later on at home I added a title and a close-up view of a bunch of freshly-cut lavender. I almost always pre-plan my pages, so I have an idea of what type of layout I want to do, where I might want to place a title or journaling, how large the sketch will be, etc. 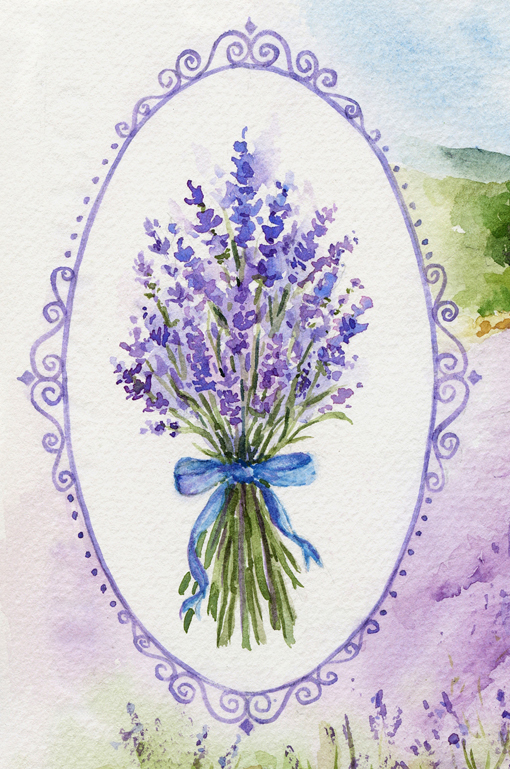 Here, I roughed in an elliptical shape for the lavender bouquet at the very beginning of the sketching process that day in Roussillon. I refined it and designed the border for it later on, but if I hadn't planned for it, the ellipse would never have made it onto the page. Taking a moment to think before putting pencil or pen to paper can result in more interesting sketchbook pages. 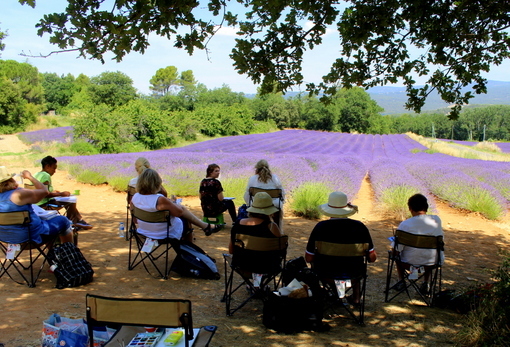 After working hard all morning on our lavender field sketches, we were more than ready for a nice long lunch break. This photo brings back such good memories of our picnic under the oak tree. The food was amazing - those fresh apricots, nectarines, and cherries were so delicious, they almost made me swoon. And it all seemed so continental! 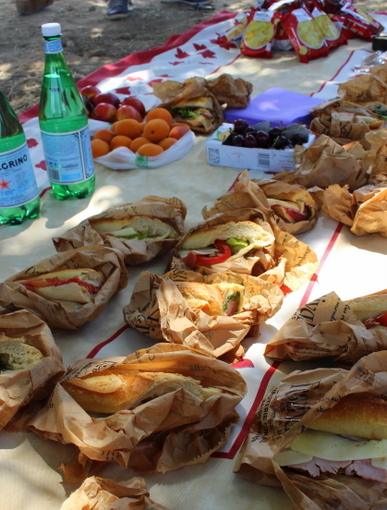 Picnicking under an ancient oak tree next to a lavender field in Provence - I mean, really, it seemed too good to be true. The whole trip was like that. If you ever have a chance to go on an art tour with Jackie Grandchamps of French Escapade, jump on it. She takes care of all the logistics, organizes everything perfectly, and chooses wonderful places for us to paint. I can't wait to work with her again in 2019 when I'll be teaching a workshop in Spain, May 6-13, 2019. You can read all about it here. 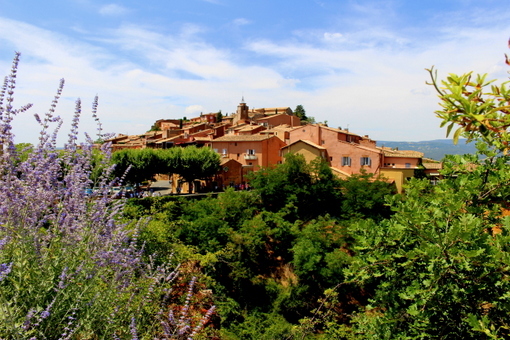 After lunch, we gathered our art gear, hopped in the vans and headed down the road to the village of Roussillon. 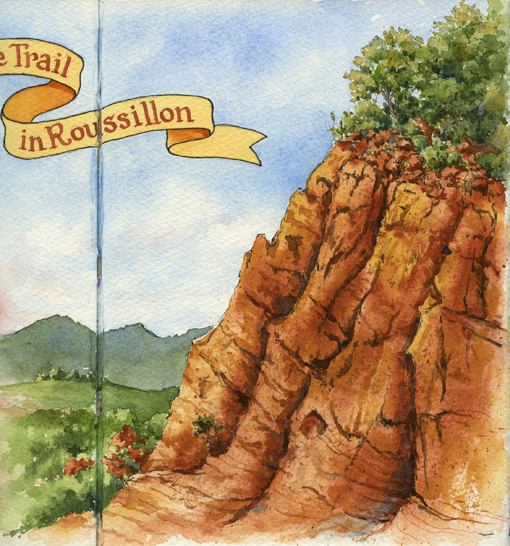 Roussillon is famous for its red cliffs and ochre quarries, where yellow, red, and brown pigments were mined in the 18th and 19th century for use in a variety of industries, including artist's paints! 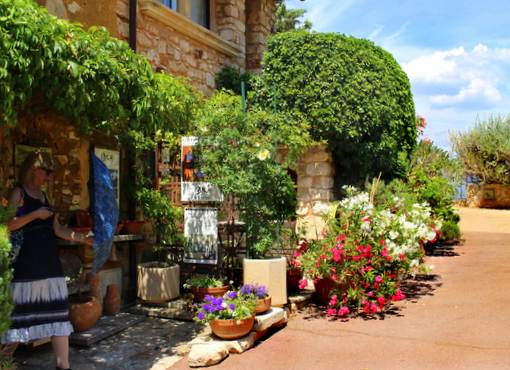 The town is one of the prettiest in Provence. This building is so pretty it looks like it must be a movie set! 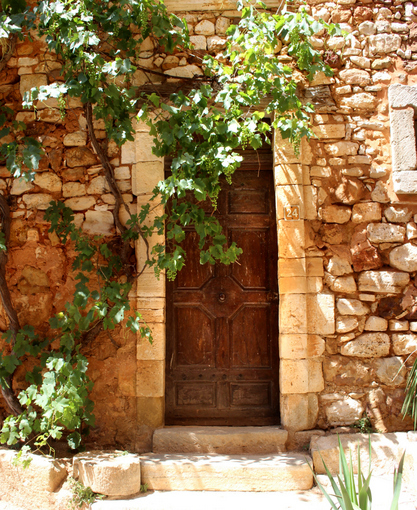 We had fun just walking around, exploring the narrow streets with their artisan shops and cafes, and taking in the panoramic views of the surrounding countryside. I stopped in a shop that specialized in artist's pigments and bought a set for a friend plus a few jars for myself. After wandering around the village for an hour or so, I had some time to sketch before I had to meet up with our group. Once again I made a rough plan for the page from the start. 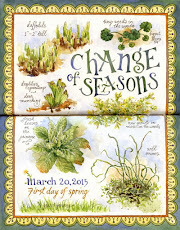 As soon as I had the idea of doing two sketches on the two-page spread, one a close-up view of a flower-covered balcony and the other a landscape showing the ochre cliffs, I roughly blocked in the areas on each page that would be filled with the images, then sketched in the title banner in pencil and lightly wrote a possible title on it. I always block in the large shapes of the sketches and the lettering before inking. It saves me time in the end, because I sketch in pencil very quickly, then have the confidence to ink fairly quickly, too. 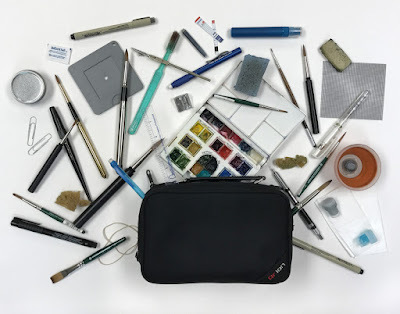 Because I know I've worked out the main shapes and proportions in the preliminary drawing, I don't need to worry about accuracy when I'm using my pen. When I ink the drawing, I use the pencil drawing as a guide, but I feel free to vary it if I want to, if I think the drawing would be better served by changing something. I also add more details with the pen that I didn't bother drawing with pencil. 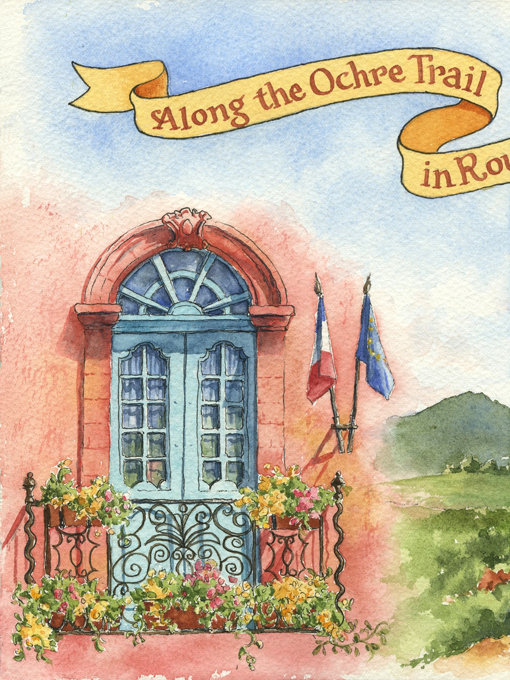 I started this two-page spread with a close-up view of the beautiful pink house on the main square (shown in one of the photos above), with its fancy wrought iron balcony, blue-green trim, flags, and window boxes overflowing with flowers. The balcony and doors were the first images drawn on the page. I blocked in the main shapes in the scene with pencil first, which only took a few minutes, then inked the drawing with my Platinum Carbon fountain pen filled with black Platinum Carbon ink. Then I walked through the village until I came to an overlook that gave me a perfect view of the ochre cliffs. I placed them on the page so that they framed it on the right side and lead the eye toward the balcony sketch on the left. I painted these pages using the ochre pigments I had bought in Roussillon plus other colors that were already on my palette. The ochre pigments were in powder form, so I had to mix them with gum arabic and water to turn them into watercolor paints. I'm not sure I used the proper proportions, but the paints worked okay and, despite being a little gritty, I think they gave me colors that were accurate and true to the ochre cliffs I saw and sketched that day in Roussillon. 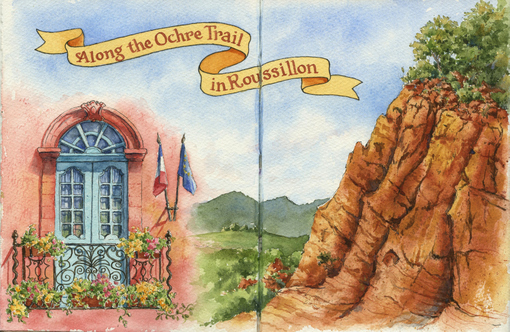 And using the pigments made me feel connected to the place I had sketched - a little piece of Provençal history, right on my page. I'll be posting on Instagram while I'm in Maine, and those posts will also show up on Facebook. 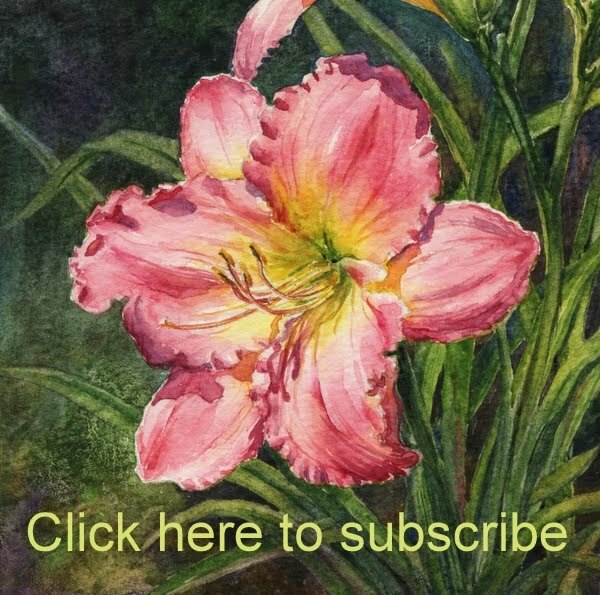 On Instagram, follow lesliefehling.